Giddy up! It’s time to mount a horse and enter the field of battle as the Black Knight where big wins await should you return victorious in defeating your enemy! A Knight was a mounted warrior who was skilled in battle on horseback and often depicted covered in body armour with a slit in the helmet to see out of, clutching hold of a large shield for protection while aiming a lance (the long spear which caused devastating impact), plus they also possessed swords too in case of close quarter battles if they were disposed from their horse. While the title ‘Black Knight’ may sound like it is based on a historical figure, those of you clued into your history will already know that no such character ever existed. Instead, it is simply a generic slot based on the mounted warriors – but don’t let that put you off as there are big wins in the free spins mode of this medieval adventure! Like many of the online slot machines developed by WMS, they first gained popularity on the floors of brick and mortar casinos in Las Vegas, proving such a hit that online versions were then created and the Black Knight slot machine is no different. Thanks to its bright and engaging design which harks you back to the interesting medieval period, it boasts a return to player percentage of 96.07% and is played across 5 reels and 30 paylines – a standard setup unlike many game engines that WMS utilises and cause new players to feel confused. The stakes are equally as generous too with bet per payline options from 1p up to £5 for a minimum spin of 30p and maximum of £150 each and every spin. If you’re a fan of the medieval period (whether it be watching movies or reading books based on such times) you’ll love the symbols that feature in the Black Knight slot machine, with ten in total and not a playing card in sight! The special symbols consist of the helmet of a Knight which is the Wild and substitutes for all symbols but only appears on the second, third, and fourth reels, while the gold Knight chess piece on a black shield trimmed with gold is the Feature symbol. There is also a King, a Queen, the Royal Jester, a crown, gold ring, map of France and England, royal gold accessory, and a sceptre. With a slot machine based the Knights of the medieval period you’d expect sounds of horses cantering, the loud clashing of swords, the impact of lances striking the enemy and so on, but nope - none of that. Instead it is bitterly disappointing standard sounds that you’d expect to encounter in an online fruit machine that play out instead which contributes nothing to the theme unlike Microgaming’s Game of Thrones slot machine which makes you feel part of the action instead! Having a free spins mode as the sole feature is a common occurrence in slots machines from WMS, and the same goes for Black Knight – it’s the only feature. It begins once you land the Feature symbol on the first, second and third reels during the same spin and rather than being awarded a Knighthood it’s seven free spins you receive. While that may sound like a small amount that is not worthwhile spinning the reels for, the expanding sticky Wilds certainly make up for it. When this lands on the second, third and/or the fourth reel it expands to cover the while reel and then remains in place, and should you manage two or three of these during the feature prepare yourself for a big reward for your duty from the King! 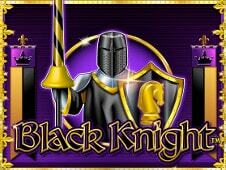 This is the original to the Black Knight 2 slot machine which is a significantly updated and improved sequel. While the graphics here immerse you in the medieval period, the sounds are incredibly disappointing as they are stock sounds used in numerous other WMS slots rather than being unique and adding a battle atmosphere to the reels. Despite 7 free spins appearing to be a measly amount the sticky expanding Wilds never fail to see you rewarded like a Knight should be for their loyal service!